Disclaimer: This isn’t a business/marketing strategy blog post. This is a coaching strategy blog post. I know what I want to do...but can I get paid for it?! “I don’t know if you can get paid - but I do know that others are getting paid to do what you love doing. I also know that if you don’t try, you definitely won’t succeed." “Can people really get money from doing what they love?” Then, he said jokingly "Like…if I want to work in a petrol station and make real money - can I do it?”. Knowing that he is a business man and has a good business head, I prompted him with a similar question. “If you were working in a petrol station and you wanted to make money, what would you do?”. “I’d get a loan from the bank to open my own station”, he replied without missing a beat. So I pushed him further, "And if that wasn’t enough money?”. “I’d open another station based on the profits from the first station…hmmm...OK, I get your point." He was only joking when he asked about the petrol station - it’s not his actual dream job. And maybe he was trying to give me a difficult question. However, the interesting thing was that he was able to come up with a solution to his own problem in 2 minutes. I'm not saying that it’s a good solution and it’s going to work, but imagine what he’d be able to do if he consistently worked on it over time. Maybe he’d come up with a lot more solutions - better solutions. Maybe he’d be able to do his actual dream job... Something worth thinking about. 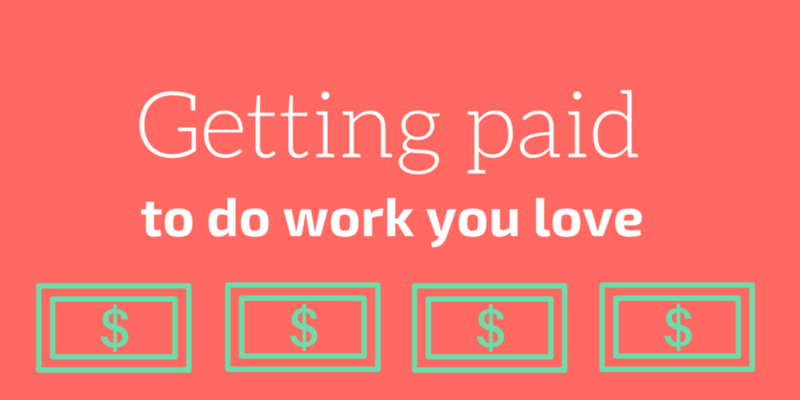 Here are some tips for getting paid to do work you love - broken down into two categories. The most obvious one - apply for an advertised job with a company that you like. Apply for a non-advertised job with a company that you like. Some people don’t feel comfortable applying for a job that wasn’t advertised, but others feel that they have nothing to lose and everything to gain. Which one are you? All businesses want two things - less problems and more money. Provide these solutions for them and you’ll at least spark their interest. Find out what else the business needs and what it wants? Can you help with that? Find out what exactly people want related to the work you’re interested in. Find out where your potential clients/customers look for you and approach them there. Model someone who’s already getting paid to do the work. Find out what do they do and how do they do it. Model people from other industries - Find out what they do and how do they do it. Test the product/service and measure it to see if it works. If it does - do more. If it doesn’t - do something else. Simple. I’m not saying it’s easy. I’m saying that if others are doing it - it’s possible. The real question is whether or not you’re prepared to do what it takes. Or if you think it's going to take you a long time to find and do work that you love - what can you do in the meantime to get you closer to your goal? I'd love to hear about any questions or comments that you have, so feel free to get in touch.